What is the relation among all the trigonometrical ratios of (90° - θ)? 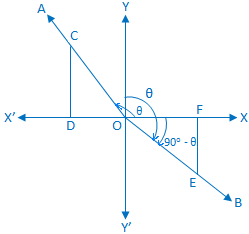 In trigonometrical ratios of angles (90° - θ) we will find the relation between all six trigonometrical ratios. Let a rotating line OA rotates about O in the anti-clockwise direction, from initial position to ending position makes an angle ∠XOA = θ. Now a point C is taken on OA and draw CD perpendicular to OX or OX'. 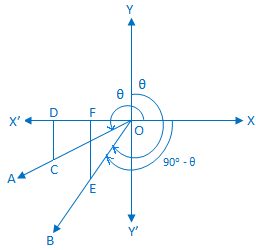 Again another rotating line OB rotates about O in the anti-clockwise direction, from initial position to ending position (OX) makes an angle ∠XOY = 90°; this rotating line now rotates in the clockwise direction, starting from the position (OY) makes an angle ∠YOB = θ. Now, we can observe that ∠XOB = 90° - θ. Now, from the right-angled ∆EOF and right-angled ∆COD we get, ∠OEF = ∠COD and OE = OC. Hence, ∆EOF ≅ ∆COD (congruent). Therefore, FE = OD, OF = DC and OE = OC. In this diagram FE and OD both are positive. Similarly, OF and DC are both positive. In this diagram FE and OD both are negative. Similarly, OF and DC are both negative. In this diagram FE and OD both are positive. Similarly, OF and DC are both negative. 1. 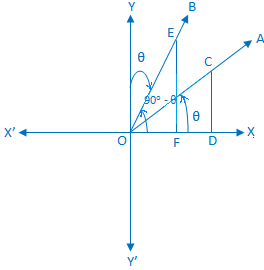 Find the value of cos 30°. 2. 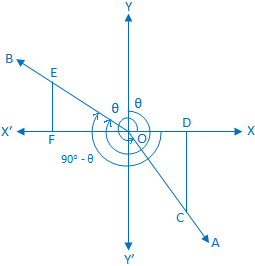 Find the value of csc 90°.